Nazareth Academy High School is a Catholic, private, fully accredited college preparatory school for young women, sponsored by the Sisters of the Holy Family of Nazareth. Embracing faith, family and education,we challenge each student to attain her full potential academically, spiritually, and personally. While focusing on service to God and community, Nazareth Academy High School provides a rigorous academic curriculum and varied extracurricular activities that inspire each student to achieve academic excellence and become a life-long learner in a global society. At NAHS, we believe that our Catholic faith is the foundation of and the impetus for all that we do both within and beyond the walls of every classroom. Rooted in the example of the Holy Family, we recognize that while each of us is a unique gift of God, we all share the common task of bringing the love, mercy and justice of God to our community, our country and our world. Nazareth Academy High School boasts a 9 to 1 student to teacher ratio. The small class sizes allow our girls the opportunity to know their teachers and classmates. Through academic rigor and a culture of togetherness, a sisterhood is formed amongst our students that helps create lifelong friendships. Our educational process is student-centered and not limited by the walls of the classroom. There are many roads to success and we strive to help our Nazareth students discover their unique talents and ambitions. One of the hallmarks of a Nazareth education is that our students graduate remarkably well-prepared for college. Megan Smith, a Sophomore at Nazareth Academy High School, has been granted a full scholarship to attend Pennsylvania Free Enterprise Week 2019 on the campuses of Lycoming College. This year marks the 90th Anniversary of Nazareth Academy High School. On Friday, April 26, 2019 the school will honor The Sisters of the Holy Family of Nazareth, Ms. Frances Wieczezynski ’66, and the Monari/Greco Family at the annual Legacy Gala. Nazareth Academy High School has a neew competitive Rocketry team, the Star Chasers! Congratulations to the following students who earned Honors during the Fall Semester of 2018. 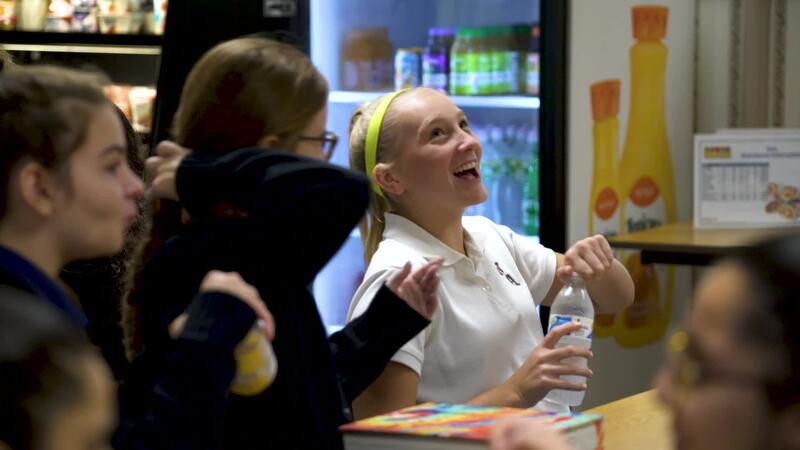 Nazareth Academy High School's STREAM program creates awareness, sparks interest, builds confidence, and fosters a culture of innovation in girls while integrating our Catholic identity into every aspect of the curriculum. It is important to note that STREAM education is not a new curriculum at NAHS, but a philosophical framework for delivering excellence in Catholic education for the 21st century learner. The total education of a young woman reaches beyond the classroom and into the community. Nazareth Academy High School’s reputation for service is legendary. Underclassmen are mandated to perform 20 hours a year of Christian service, while seniors are charged with performing 30 hours. However, these requirements are easily achieved as Nazareth students average over 15,000 hours of Christian service every school year. With more than 40 clubs and activities to choose from, Nazareth offers countless opportunities for students to explore extracurricular activities and to develop leadership skills. Our clubs are student-designed and student-led, with a faculty adviser who offers guidance and mentoring. Our students and faculty are passionate about their interests – and they often extend their club commitments well beyond the boundaries of our schedule and campus. At Nazareth Academy High School there is nothing we are more proud of than our Catholic values and traditions and the teachings of the Sisters of the Holy Family of Nazareth. The faculty and staff inspire our students to live their faith and develop their spirituality on a daily basis. Our students begin each day with daily prayer and they are encouraged to share their special intentions with their classmates. As the only private, Catholic high school for girls in Philadelphia our students live that experience everyday and our faculty and staff is committed to upholding these distinct core values.